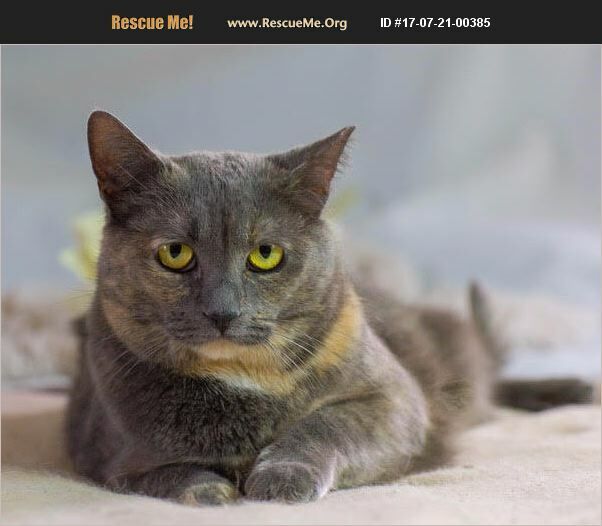 Rain is a very beautiful gray/torti unusual color female kitty. She is about 5 years old, spayed, current on vaccines and combo tested negative. She is flea free and litter trained as well. She was abandoned by a heartless family who moved and dumped their cats outside. A very kind neighbor took them in, got all their vetting done and has taken very good care of them. Rain is a very loving kitty. She loves to be petted and will roll around in pleasure when you pet her. She likes toys and will chase a fishing pole type toy when you dangle it near her. She is laid back and great companion. Rain loves to sleep near you. She gets along great with other cats and dogs in her foster home. For this reason, we want to adopt Rain to a home who already has at least one cat or is willing to adopt Rain and another kitty. We'd love for Rain to have a screened in porch which she adores spending time on. Rain is very grateful for being rescued and shows it in her love for you. Adoption fee and application. Vet paperwork provided.